Many early videogames were inspired by technological innovations. Advances in natural language processing led Will Crowther to create Colossal Cave Adventure1 and John Carmack’s smooth-scrolling PC engine would inspire the future developers of Id Software to create the side-scrolling Commander Keen series2. Such connections are probably unsurprising to most people, as both games seem like natural ways to explore their respective technologies. When talking about a game that began as an algorithm to procedurally generate fractal landscapes, however, I doubt that creating an open world adventure game full of dialoge-based translation puzzles would be the first thing that most people would expect. Of course, Captain Blood isn’t really the kind of game that fits nicely with most peoples expectations. Released in Europe in 1988 as L’Arche du Captain Blood, the game was notable not only for pushing the graphical capabilities of the Atari ST computer, but for blending together an eclectic assortment of game mechanics that makes it a memorable experience, to say the least. To those familiar with videogame history, the development of Captain Blood is reminiscent in many ways of that of Doom, which would follow five years later. As with the case of Id and Doom, the development of Captain Blood began with the meeting of two talented developers, each with a skill set that complimented the other. In this case, it was the cinematic storytelling of Philippe Ulrich, one of the co-founders of ERE Informatique, and the low-level graphics programming of Didier Bouchon. Although it never reached the same level of commercial success as Wolfenstein or Doom, Captain Blood was, at the time, by far the most successful game ever developed in France3. Also like Id, the developers at ERE were known for their outrageous promotional events, several of which involved making sacrifices to their fictional god of programmers, Exxos (after whom they would eventually rename their studio). These included such theatrics as decapitating latex aliens with an axe and smashing an Amstrad PC in the middle of the Champs-Élysées3. The most conspicuous point of departure between the two studios is the place of narrative in the design process. While the explicitly narrative elements of Doom consist of little more than the single screens of dense text that await the player at the end of each episode, the story of Captain Blood begins with a seven chapter novella included in the box. Although the story of Captain Blood is still the same kind of nihilistic macho fantasy that appeals to angsty teenage boys, it takes a very different approach. In Doom, the player can run around killing and destroying everything in the game because everything of value has already been ruined – the only humans you meet have been turned into bloodthirsty zombies and even the environment around you has been twisted and corrupted. In Captain Blood, you encounter dozens of different aliens, each with their own distinct speech patterns, personality, and relationships. You are also given the ability to casually nuke their entire civilizations from orbit. While such decisions should probably give the player pause, she is insulated from emotional attachment with these characters through the framing fiction of the game. Blood never speaks to any other creature in person, but rather sends biomechanical drones down to the surface of the planet while he remains safely on his starship. If you read the lengthy backstory before booting up the game, you learn that Blood is in turn merely the avatar of a computer programmer that was sucked into his own game. Thus, when the player destroys an entire planet in Captain Blood, she is merely playing as a programmer, who is playing as a cyborg, who is watching through a drone as it kills people who are, themselves, a fiction within a fiction. Since the core of the game is all about communication and relationships, I actually find the protective layers of proxies within proxies to shield the player from becoming too immersed in the game world to be one of the weaknesses of the overall experience. Although allowing Blood (and therefore, the player) to have a more real connection with other characters in the game might have taken the fun out of joyriding around the galaxy committing genocide, it would have made the decisions made throughout the game seem more consequential. The objective of the game is for Captain Blood to track down and eliminate five clones of himself that were created during a hyperspace accident. These clones can’t simply be killed from orbit, as each possesses some of Blood’s “vital fluids,” which he needs to survive. Thus, each clone must be lured aboard Blood’s ship where it can be disintegrated and its “fluids” extracted. His only lead at the beginning of the game is a single inhabited planet. From there, Blood must begin gathering more clues, following one lead to the next and until each of the clones has been found. UPCOM differs from other conversation systems like the keywords in Ultima VII or the menu-based dialogue trees of modern RPGs in subtle, but important ways. Because both the aliens and the player are subject to the same constraints, Captain Blood avoids the artificiality that you get in games where NPCs can go on talking for paragraphs while the main character is only able to offer single-word responses. The abstract nature of the UPCOM symbols gives the illusion that the aliens you communicate with are intelligent creatures that are struggling to use the system just as you are. 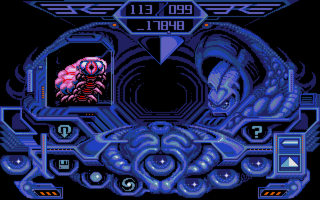 The UPCOM interface is also one of the most effective ways in which the game characterizes the often bizarre alien creatures that inhabit the game world. Different species use different subsets of UPCOM icons in order to represent their language. The number of icons available to each species becomes an indicator of their intelligence and eloquence of speech. The less restrictive nature of the system (the full UPCOM set provides nearly a trillion different possible combinations) allows for a wide variety of conversation topics. While some messages require a precise word order (most often with passwords, coordinates, or names), usually the mere mention of a word or phrase is enough to start a conversation. The player’s goal is usually to prompt the character to reveal a piece of information or issue some kind of quest, but most characters will try to say something relevant to whatever you ask them. These responses are often little more than repeating a simple maxim, such as “bad not good,” but even such canned responses vary from species to species, giving the player some sense of distinct cultures. The Izwal value science and learning and dislike violence. The Buggol are obsessed with politics, with certain individuals being prone to bursting into long, prepared speeches. The paranoid schemer Yukas tends to misinterpret simple statements as veiled threats. By limiting the conversation to a finite set of possible topics, it enables characters to say something about almost everything, in contrast to a Zork-style text parser which must keep commands very formulaic to avoid paralyzing the player with boundless freedom of choice. While its puzzle-like dialogue system was decidedly innovative, Captain Blood is perhaps better known for its prohibitive difficulty. This is evident as soon as the game begins and the player realizes that there are no menus. 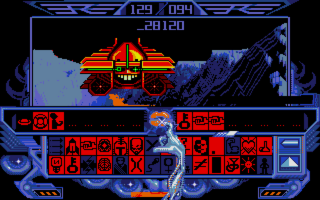 All the controls and commands within the game are represented diegetically as ambiguously labeled buttons on the Gigeresque console of Blood’s techno-organic ship. Even the cursor is represented by the captain’s own withered cybernetic hand. While this certainly makes the game seem more immersive (which, again, seems to conflict with the goal of its convoluted backstory), it sets up a fairly steep learning curve. Despite stepping into the role of a vindictive, godlike sociopath, I think I killed far more people by mistakenly hitting the wrong button than I ever did on purpose. The bulk of the game’s difficulty can be attributed to the conversation puzzles themselves. Some of this was due to the intentional ambiguity of the UPCOM symbols, particularly when they were used figuratively, as in the case of names. While a few key characters and places possess their own individual symbols in the UPCOM language, most names are simply made up of other symbols. This leads to names like the Migrax warrior “Missile Brave”, the Sinox scientist “Brain Radioactivity,” and the charmingly named Planet “Kill You.” With the limited list of UPCOM logograms, it becomes difficult to know that someone is referring to the Migrax “Missile Brave” and not simply trying to convey that the Migrax as a species are not afraid of missiles. The more significant issue with the design of the dialogue puzzles is much more subtle. While the back-and-forth nature of the conversations is difficult in itself, some information will only be divulged under specific circumstances, the details of which are usually unknown to the player. In some cases, a character will offer to divulge information after a quest or mission of some kind – often transporting them to a different location or killing one of their enemies. Other times, there is a similar stipulation that is never stated. Some characters won’t talk unless you bully them by abducting them and stranding them on a different planet. Some won’t talk if a certain character is still alive. 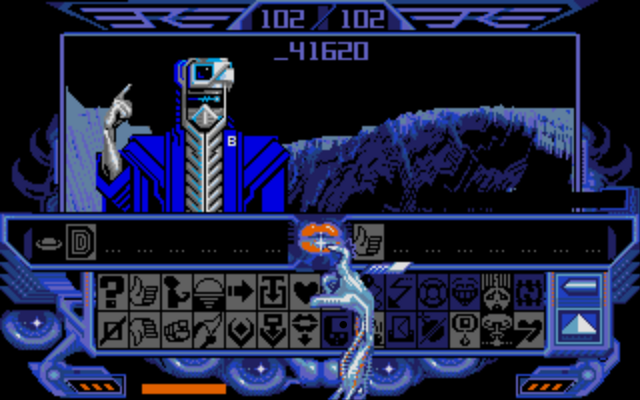 Some characters won’t even appear to the player unless certain conditions are met, giving the illusion of an uninhabited planet. Perhaps most frustrating of all, some characters will only reveal certain clues after a certain amount of time has passed in game, giving no clue to the player that they have something more to say nor letting her know when they’re ready to talk. The fact that the player never knows who’s holding out on her becomes problematic if she takes the characters’ quests at face value. In most games, quests are fairly straightforward. Although some quests are optional, each one is rewarded and generally gets the player closer to victory. In Captain Blood, however, quests often contradict one another as various factions try to eliminate one another. Likewise, many characters lie, and hard-earned information occasionally ends up being worthless in the end. Naively completing every mission will quickly end up killing characters with information necessary for completing the game, leaving the player stranded and confused. The idea of unreliable information from NPCs is actually something I enjoy exploring. The first time I remember this happening in a game was during one of the Hong Kong missions in Deus Ex. Although the character who issued the quest was highly suspicious, RPG genre conventions convinced me that the objective was genuine. The difference in Deus Ex is that as soon as I tried to complete the dubious quest, alarms went off, guards rushed in, and I knew that I’d been played. In Captain Blood, there was no way to know if the planet I had just destroyed or the alien I had just disintegrated was holding some important clue that was necessary to completing the game. It was often just as hard to determine if the reward for my grisly work would lead me toward my goal or simply into another dead end. In a rather subversive twist, it would seem (after starting over countless times) that the best approach to playing the game is simply to holster your world destroying bioweapons and try to spread as little death and destruction as possible. The ambiguous trial-and-error aspect of the game served to compound some of its other shortcomings. The landing sequences, which were where Bouchon’s work on the game began, are still visually interesting twenty-five years later, but quickly become repetitive. They are similar in many ways to the space combat sequences in Star Control II, another epic adventure game that was built around an arcade-like action sequence. 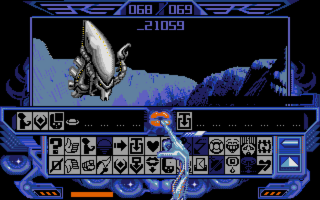 Although the action sequences in Star Control appear even more frequently, they constantly introduce new ships and new weapons. 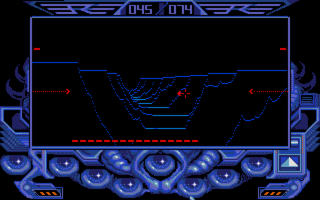 Captain Blood breaks the repetition early on by adding missile bases to most inhabited planets, forcing the player to fly low over the landscape, but this remains the pattern for the rest of the game. 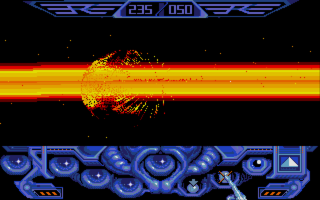 While adding more variety in planetary defenses may have been overly ambitious for the Atari ST, it would have served both to keep the landing sequences interesting and to give the ship’s scanners an actual purpose. As it is, the landing sequences make exploring new planets an arduous task, which is not usually what you want in an open-world game. Despite the success of Captain Blood and the developers’ plans to expand on their ideas with an even more involved sequel4, Exxos would be a short-lived studio. Exxos, like Id, would clash with its publishers over profits and royalties, but in the case of Exxos, the publishers would win. Some lackluster sequels would eventually be produced, but none would prove as innovative as the original. Captain Blood is certainly one of the more obscure games from which I draw inspiration, but I’m still surprised at how original it seems after twenty-five years and how relevant it is to contemporary game design problems. Not that Skyrim or Fallout would be improved by adding a complicated system of logograms every time you try to speak to someone, but it’s interesting to think what these sorts of systems might have become if they had been iterated upon as much as the ideas from Doom. 1. Replay: The History of Videogames. Tristan Donovan. 2. Masters of Doom: How Two Guys Created an Empire and Transformed Pop Culture. David Kushner. 3. La saga des jeux vidéo. Daniel Ichbiah. 4. Le retour des héros. Tilt (March 1988).